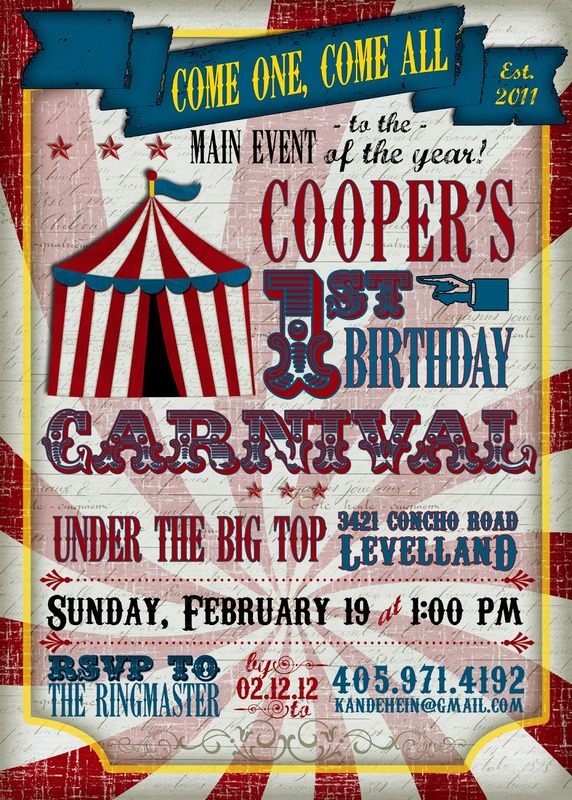 The Birds & The Peas: Cooper's First Birthday Vintage Carnival Party! The time has come. Our baby boy has turned 1! I love planning events - but planning this special party for my baby was especially fun! 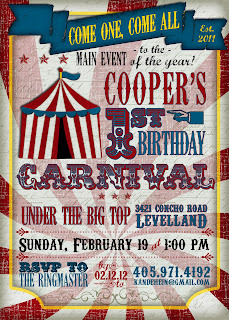 There are so many great invitations and ideas that me and Stacia pinned to the "1st birthday inspiration" board but I finally landed on a Vintage Carnival theme. When I started putting the party together there wasn't a lot of resources with the party planning details and ideas all in one place but there was a lot of interest for the theme. So, I wanted to write this post with a little different take: the anatomy of the party. Enjoy! First I had these adorable invites and labels customized from Frosting & Ink that I found on Etsy. I also had Frosting & Ink create these customized stickers that I used as the cake and smash cupcake topper. Our local grocery store (United Market Street) accepted the file via email and created this perfect sugar coat topping for the cake - at a fraction of the cost of having a custom carnival cake made. a jpg file, 1 day notice and about $20. that red icing is a bad idea all around - messy, stains, bitter. We also repurposed the stickers to decorate pennant flags draped from the ceiling in four directions like a big top. I created the flags simply using fabric scraps, pinking scissors (for the edging detail), bunting tape and a stapler all from Cooper's Great GrandBoddy's collection. Easy DIY pennant flags - took a total of 3 hours to create. We customized carnival-size lollipops with the stickers. Customized carnival lollipops - found at Family Dollar for... $1. The outside of the house was decorated with this great carnival sign, balloons and a welcome sign. Large, canvas carnival sign. Found at Hobby Lobby for $12. We decorated the table with all things vintage carnival including loads of popcorn in these cool paper containers that doubled as party favors. Paper popcorn containers. Found at Target, snacks section, 8 pack, $3. We also decorated the table with peanuts in the shell, cokes in glass bottles, striped straws, boxes of animal crackers, Twizzlers, and cotton candy. View of the party table. Cotton candy and striped straws found at Hobby Lobby. Animal crackers, peanuts found at Target. I gave the punch a carnival feel by adding these floating ducks. Floating duckies found at Family Dollar for... $1. We had a Face Painting station marked with this canvas banner hung above the bar. Face Painting canvas banner found at Hobby Lobby, $5. And here's the birthday boy caught in mid-run with a custom iron-on also created by Frosting & Ink. I also wanted to capture some fun images of the day with a photo booth so we created one in a separate room using a large piece of fabric found at Hobby Lobby, a section of the pennant flag, balloons and of course photo props. We set the camera on a tripod (with directions attached) and set it to take the picture after 10 seconds so that the party-goers could come and go and have a little fun! Here's a few of our favorite shots from the shoot. with $1 props from Target. Cooper also got a ton of presents from all of his wonderful family and friends. Many of the toys are being shipped but here are just a few of the great gifts Cooper received. A board book created just for Cooper with lots of pics of family - from his Nana and Pops. B. You bathtime boat with fishing rod and fish from Cooper's Aunt Monica and crew. A giftcard to Toys R Us and spending money from his Aunt Sandy and crew that we used to purchase several of Cooper's favorite Baby Einstein videos, books and more. And even more spending money from his Great Grandma Big Spring that we used to buy one of those push popcorn toys. Our sweet friend Jeannie that is expecting! got Cooper a present including this handsome little button down shirt. He also got an Oklahoma tee and a collage picture card from Cooper's daycare buddy Milo and his mommy and daddy. A riding ATV from his friend Abby and her parents, a sock monkey jack-in-the-box from Cooper's day care teacher, Penny. It was so wonderful to see all of our friends and family for Cooper's special day and what also turned out to also be a surprise going away party (thanks for planning Nani! ).